Back in November when I wrote that Internet TV will mean the end for channels I could see clearly (in my own mind at least…) that arranging linear schedules of TV programmes was an accident of history – a product of the limited available spectrum for distributing video content and the high cost of local storage and processing. Moreover channels add a layer of inefficiency to the business of finding programmes to watch that we could all do without – surfing through channels (the average US consumer now has 102 – remember Bruce Springstein…. ), remembering what time something is on, buying a machine to record it, etc. etc. Making this kind of observation is all very well, but to predict the end of something you need to have a view on what will replace it and how the change will happen. The ‘what will replace it’ bit is easy – picture an iTunes style interface with playlists recommended by your friends and favourite pundits will link you to websites where you can download or stream the music. I’m guessing downloads to start with followed by streaming as high bandwidth networks become ubiquitous. The ‘how it will happen’ is harder, and it wasn’t until last week when I was talking with IPTV startup Inuk that I started to get a picture of this. Despite the inefficiencies I mentioned above (and in more detail in my previous post) people are pretty happy with the way TV works. TV is a mature product and millions of people watch it – hours and hours of it in fact. So any change isn’t going to be quick, and it isn’t going to be revolutionary. Rather it needs to start with the existing paradigm of linear programming and move people in incremental steps to the new world. The evolution I am glimpsing starts with people watching existing TV channels via a signal that comes through their computer. The first step could be a presence application that lets you see which of your friends are watching the same programme. Then comes chat. Then comes friends putting links to new programmes in the IM window, or links to playlists they have enjoyed. By this point the first place that people will go looking for inspiration when they want to watch TV is in the links and playlists their friends have provided, and at that point the demand for linear programming could start to drop off quickly. The exception to this might be people who have the TV on all day as background – but in this case too I suspect clicking on a long playlist will produce a better experience than watching say BBC1, and with minimal extra effort. There are lots of building blocks that need to be in place for this to work and lots of places you can go with recommendations (including the obvious last.tv) but this is how I see the world ending up. As a parting shot – one of the more important building blocks and one where I have yet to see a full answer is the next generation EPG. The interface will need to be significantly more complicated than today and current remote controls may not cut it. All thoughts here welcome. Facebook is hitting some growing pains at the moment. At the 60,000 ft level it’s momentum is incredible to see (posts like this from Australia are all over the web) but at the same time it is getting blocked by increasing numbers of corporations and some power users are starting to find it annoying. I suffer from my own communication overload problems and sympathise with Jason and Fred – but the answer here is not to turn away from Facebook altogether, but to find ways of filtering out the noise. Otherwise you have given up on all the value that got you involved with Facebook in the first place. I have written about the importance of good filters before, and it is becoming increasingly clear that Facebook is failing it’s key users in this respect. Facebook helps massively with that first piece – getting the relationship started. He has the Snapvine app, so I can leave a voice mail for him. He tells his friends where he lives (has a Yahoo Map gadget that shows that, of course). Puts all his Flickr photos up. I know his mood. I know what party he’ll be at tonight. I know someone at Microsoft that he’s talking with and who visits his page, so I know some influence networking that I could do with him. I know his college experience and his past work experience. If you doubt the value that Facebook provides read the posts from Scoble and JP (both of them) – and as JP says playing King Canute is not a smart thing to do. But as JP also says, there will be other Facebooks, and there may be better Facebooks, and if their functionality continues to fall behind the requirements of their power users the $10bn valuation they are after will remain elusive. As an aside on the power of Facebook to turn your network into your filter I got to the posts from JP via the Blogfriends Facebook application which puts blog posts from my friends into my profile according to keyword filters. As I have mentioned before Blogfriends is the brainchild of my friend Luke Razzell and the guys at Brainbakery and I’m pleased to hear that it is starting to take off. Tonight I interviewed Siemens Web Strategist. He noted that at Siemens they already have more than 6,000 employees on Facebook (most added in the past month). So, apps for Siemens employees will come soon. Why? I bet more employees will soon be checking Facebook than checking their own intranets. To people who think this is just hype: you’re wrong. I’m willing to make a $100 bet that’ll go to charity if it turns out that Facebook goes away. This one isn’t going away and is going to be HUGELY successful. You don’t get 6,000 employees at Siemens (and they are FAR from the only one) to join without getting value back in return. If these 6,000 Siemens employees are using Facebook for business purposes then this is classic enterprise2.0 – Facebook becomes a lightweight collaboration tool with an edge in adoption model. Critical to the success of this notion will be Siemens employees writing their own Facebook apps. This is potentially very powerful in terms of end user functionality. We are talking enterprise here though, so questions about security will have to be answered. This might be where pureplay E2.0 vendors like Trampoline Systems, Huddle, socialtext and 37Signals step in – leveraging the social platform that FB provides could increase their functionality and at the same time limit depth of FB’s progress into the enterprise (although not the reach). And as Scoble says, it isn’t just Siemens. The BBC is probably the most talked about place this side of the pond where it seems everyone is on Facebook. So I pity Telstra – ironically blocking their employees from using FB might actually reduce productivity. Judging by the number of comments I get my posts on the buyout cycle are not the most popular ones on this blog – so I have been writing less of them. This one is important though (but I’ll still keep it short). The reason I care about the big buyout cycle is that when it turns I think we will see an increase in cash for European venture. That is good news for entrepreneurs and over the long term good news for investors as well. I say over the long term because in the short term increased cash in the market will translate into more competition for deals which isn’t particularly in my interest – but over the long term it is in everyone’s interest to have a healthy and growing ecosystem. So, the big news yesterday was that banks have thrown in the towel on trying to raise debt for two of the biggest buyouts in play right now – Boots here in the UK and Chrysler in the US. Guy Hands might also be struggling to get the debt he needs to acquire EMI. The buyout boom over the last couple of years has been fuelled by cheap debt which has enabled investors to buy companies with less equity and make great returns. If the supply of debt dries up that equation will fall apart and returns will suffer. The underlying investors in the buyout firms will then look to invest there money elsewhere and my contention is that a goodly proportion of it will come into European venture. It certainly should. The returns are there to be had right now – we are witnessing a wave of innovation and company formation like we haven’t seen for a while and there is plenty of capacity in the market to put more money to work and still generate great returns. LindenLabs have done a great job of building a buzz round SecondLife that has made it seem bigger than it really is and the whole SL hype machine has also had a huge boost from the interest that traditional media has taken in the worlds favourite virtual world. These two things have combined in a positive feedback loop which has taken the hype to higher and higher levels. The most real result (geddit??) has been big corporations rushing to build presences in SecondLife – this has had the dual benefit of generating lots of offline column inches and keeping their brands on the leading edge. The problem with all this has been that the hype got way ahead of the real activity, and when that happens disappointment usually follows. We saw the first signs of that earlier this year when people started analysing SL’s usage stats and showing that active users were only a small fraction of the headline Total Residents figure (now standing at 8.3m) and hence SL was overhyped. My thoughts on this subject from January are here. Now the disillusion has reached a new high – at least if this article from the LA Times is to be believed (thanks to Sam at Blognation for the link). the sites of many of the companies remaining in Second Life are empty. During a recent in-world visit, Best Buy Co.’s Geek Squad Island was devoid of visitors and the virtual staff that was supposed to be online. The schedule of events on Sun Microsystems Inc.’s site was blank, and the green landscape of Dell Island was deserted. Signs posted on the window of the empty American Apparel store said it had closed up shop. If you read the article you will see that many of these companies are starting to leave SL. This doesn’t surprise me. Dell et al didn’t go into SL because people wanted to visit them there, they went in for the first world brand benefits. Further, if there are many more articles like this one maintaining a presence in SL will start to be seen as a PR stunt – which will hurt brands rather than help them. Hence the start of the exodus. But this isn’t all bad news. In fact it is part of the natural evolution of any new technology/market. 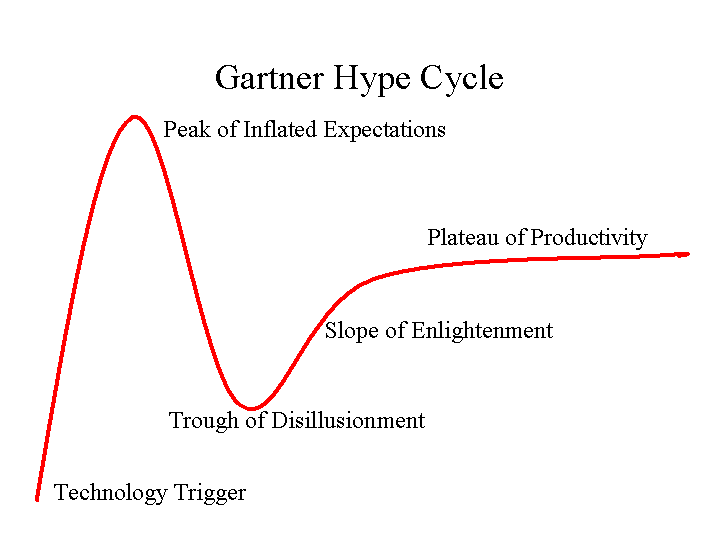 I’ve seen this Gartner hype cycle applied to just about every market I’ve been involved with, and now it is happening to SL. The good news about this, of course, is that coming off the “peak of inflated expectations” forces people to focus on doing things of real value. To my mind that is when we will really start to see the benefits that virtual worlds can bring. Between May and June, the population of active avatars declined 2.5%, and the volume of U.S. money exchanged within the world fell from a high of $7.3 million in March to $6.8 million in June. I hope that this is just a blip. I love reading Marc Andreessen’s blog – nearly every time he gets me thinking about myself and what I’m doing as a VC in a way that (hopefully) makes me smarter. What is the most important ingredient for a startup? And if you substitute product for team it still works. So a great market wins every time – I couldn’t agree more. In theory a startup can change it’s team, it’s product or it’s market, but for me the market is by far the most difficult to play with. This debate alone is probably worth a whole book and if you want to get into it more check out Mark’s post, but if I’m going to invest believing in the market is all important. Marc goes on to talk about the importance of getting to product/market fit – and this is the point I really want to draw out. Unfortunately very few companies get the market and the product spot on with their first attempt – there are far too many unknowns for it to be any other way – which then means that success is all about doing everything you need to do to get that fit right. I had a guy in here last week with a consumer internet startup, seed stage, who I really liked precisely because I got an overwhelming sense that he would be awesome in doing everything it took to iterate his way to success – and this is a really tough thing to do. Gathering feedback is hard (not many people want to talk to you at all and nobody wants to tell you your baby is ugly), working out which bits of that feedback are good (and not good) is tough, as is figuring out which of your initial beliefs/prejudices to jettison, as is constantly getting knocked back by customers/investors, not to mention the stress of living with the possibility that you might not be onto a winner. This chap has a really good concept and plan (he is still in stealth mode so I can’t say what it is) but about the only thing I can say for sure is that he will have to change it – that said I have confidence that so long as the market call is right he will find a way to succeed. So in this case I really believe in the market and think this is the guy to after it – which might mean I make an investment. If it was the other way round – I really like the guy, and I think the market might be interesting – then it wouldn’t be a runner. In my experience, the most frequent case of great team paired with bad product and/or terrible market is the second- or third-time entrepreneur whose first company was a huge success. People get cocky, and slip up. There is one high-profile, highly successful software entrepreneur right now who is burning through something like $80 million in venture funding in his latest startup and has practically nothing to show for it except for some great press clippings and a couple of beta customers — because there is virtually no market for what he is building. As a VC it is easy to make the mistake of backing rock star entrepreneurs when you have doubts about the market they are going after. Believe me. After all – who is to say your assessment is any better than theirs? To bring this to a conclusion, I guess what I’m saying is that you can’t spend too much time making sure you have a market to go after (and if you want to build a big company it had better be a big market) and then understanding exactly how your product will take share/dominate it. Doing this well is not about finding an analyst report that says XYZ will be huge in 2012 – it is about bottoms up analysis of what people will do with your stuff. The print version of the FT today had a backpage article about Facebook entitled “Why we’re worth $10bn“. From a journalistic point of view this is interesting because this article was first made available on their blog last week and because a traditional financial paper is willing to debate whether Facebook might be worth $10bn (to an extent at least). More interesting for me though were the comments towards the end of the article about Facebook heading towards an IPO. That said – I would love it if Facebook has got this challenge licked and goes public (provided it was at a valuation that isn’t over the top). I say that partly because it would be great to have another good exit in this space, but mostly because it would put details of social networking revenue models and their success firmly into the public domain. That would make new social media businesses more financable and be good for the industry as a whole. Over the last couple of days I have been pondering the pros and cons of consumer internet businesses outsourcing development. At the Glasshouse event this week Michael Birch (CEO of Bebo) described how he personally developed his first social networking site – Ringo. The story goes that he was introduced to Friendster, loved it, and after playing with it for one hour decided he needed to build something similar himself – and then spent the next 13 days doing just that. There is something about the passion that story shows and short time from idea to live site that attracts me to this development model (although I’m sure Michael re-used a lot of code from his previous ventures). The other benefit of doing your own development is that it makes it easier to change course part way through, or indeed all the time. That can be important in the early days of a project when your ideas are evolving rapidly. Also I kind of feel that you will get a higher quality result if you have your own team of people who are passionate about what they are doing – particularly in the case of consumer internet where the developers are often target users. The other side of the story, though, is that inhouse development means employing more people and getting locked in to their way of doing things. Or to put it the other way round – outsourced development gives you more flexibility both in terms of resource (you can scale up to meet deadlines and then back down to zero) and technology choices. From a financing perspective this means less risk. There is also the benefit of lower cost if you outsource your development to Eastern Europe or India. I’m thinking about this issue as I consider investments in businesses that have both models and whilst you can build successful companies both ways I am heading towards the conclusion that on balance having at least the core of your development in house is the model I would go for. I’m not sure though, and I know that a number of you have a strong vested interest in one side or the other of this argument so I’d be very interested in anything that advances these thoughts. There was a great piece in the FT yesterday about Microsoft’s struggle with innovation. Despite some bold moves and substantial investments into new areas (most notably games consoles and mobile) it’s market cap has been stuck around the $300bn mark for some time now. In that time Apple and Google have both exploited new areas theoretically open to Microsoft – digital music and search – and added $250bn to their combined market cap. Google and Apple by contrast were able to go after markets they hoped and believed would be huge, but which could have turned out to be merely big. Even in that latter scenario their shareholders would have been happy – not so for Microsoft. This is why small companies will always have a chance. If tens of millions of dollars will move the needle for your shareholders you can go after markets much earlier than your larger competitors – if you are good that will give you a leadership position which is yours to lose. Most recently I have seen that at Tribold where we led a $15m round earlier this year. Simon and Catherine the founders there saw an opportunity in product management software for telecoms operators back in 2003. They set the company up in that year and are now in a leadership position in what remains a nascent market. The Microsoft equivalents in this space are Amdocs and Convergys – they only woke up to this opportunity last year which gives Tribold every chance of dominating this market as it grows. Luke has just posted the second in the series here.